As we recall the campus upsurge of May 1970, and the student movement and youth rebellion it gave rise to, it's equally important to recognize how much of today's struggle is youth-driven. We've covered the fight over public education that began on the west coast and became a nationwide battle on March 4th with NJ efforts in March 4: Young teachers lead the fight in Newark, NJ, Young Teachers Lead The Way In Newark (part two), and Spring 1970 Student Upsurge — Spring 2010 High School Walkouts …Not so different. And the battle over Newark's water supply (reported on here as Black NJ: The community fights "Hollywood Booker over right to water… Newark Wins!) was largely driven by the young folk. May '70: 7. How Can You Run When You Know? May '70: 4. The Eruption Begins! 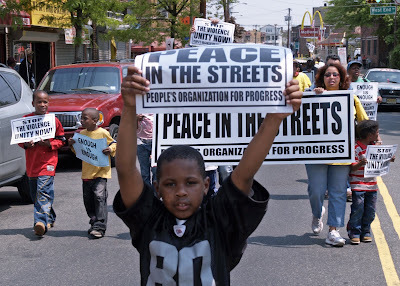 Black NJ says: May 1st—Justicia Ahora!! !